I went to New Orleans to catch nin, jesus and mary chain, and kite base. As usual, it was an awesome show. Michelle came with me, so it was even more fun. Alice and I went on a road trip to meet her father and cousin, Michelle, in Chatanooga, TN in time to see the total eclipse. It was thrilling and amazing. It was the best way to cap off an entire week of visiting with Alice. I was excited like a boy on christmas, and as the moon blocked the sun, Alice increasingly gained my enthusiasm. When the eclipse reached the pinnacle and the audience cheered and clapped, she was beaming with excitement and that filled me with joy and happiness. She is a funny, intelligent, and witty girl. I enjoy listening to her talk about everything and going on imaginary adventures with her. Unarmed teenager is shot several times, killed, and body is left on street for several hours. Police claim he was a thug. Unarmed Residents react with negative comments. Police carry assault rifles to the funeral. Unarmed Residents peacefully protest. Police bring in tear gas and riot gear. A few protesters start rioting and burned a convenience store. Police start shooting into crowd with “rubber bullets” and concussion grenades, mark area as a no fly zone, use helicopters, and bring in a tank. Unarmed Residents keep nightly vigil of protests. Police chief says there is no curfew, but Police arrest reporters and residents who protest at night. National news broadcast focuses on rioting and looting (which has been very little). Cattle rancher refuses to pay fees for grazing on public lands, claims god behind him, and that he is not subject to federal laws. Armed supports gather at his ranch and declare they will kill any federal officers and state they will use women as shield. Cattle Rancher is called a hero for individual rights, appears on several news broadcasts and given a platform to argue his illogical stance. He has still not paid the fine which is over a million dollars. Police refuse to intervene, and Federal officials decide to not push matter. Politicians argue that Federal government agencies shouldn’t be armed and that the agency overstepped it’s bounds. So what makes the difference in responses? On a lucky coincidence, I was heading home from Austin and discovered I was only 4 miles away from my parents at Terry and Randy’s house in Houston. Headed over there and had a great time visiting with Michelle, Terry, Randy, Bill, Margie, Rob, Dad and Mom. They had cooked dinner of roast, rice, potatoes, and green beans. It was a great spur of the moment event. I enjoyed every moment of it. I wish I lived closer to them. I always enjoy my time with them. On the ride home, we (mom, dad and me) saw a double rainbow over Abbeville. It was a good day, but tiring. 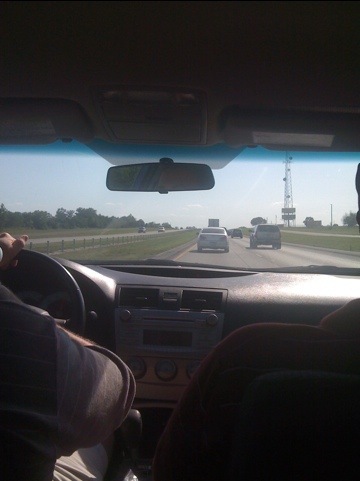 Heading to austin with jeff and coach. Well, Amanda is having Natalie do her hair while I am putting some music on the ipod. Today is the day we make this relationship “official”. 12 years and people still ask me if I am nervous about marrying Amanda. So for all the people I didnt invite I apologize. It was a rough September, and everything got messed up. Posted in main	| Comments Off on Big Day!! Well, its that time again. Time to head up north and hope your house is there when you get back. This time all of Louisiana below I-10 is being kindly asked to shove off. Guess Gustav is coming to make up for what Rita and Katrina missed. Well, I’ve decided to leave. Not really because I think we are in that much danger, but because it would ease the minds of my parents who have already headed to Dallas, TX. The only question remains: San Antonio or Dallas? hmm. Talk to you later. Hopefully not much later. The cast is off. Amanda’s taking it easy. The doctor told her to slowly put weight on the foot over the next few weeks until she can walk on it. Here is a copy of the first x-ray.